It felt a little funny heading over to Porchetta for lunch. I mean, I live right next to Italy and had amazing porchetta there just recently. So why am I taking a lengthy subway trip down to the East Village for lunch? And I was tempted even further when I was on the way to meet my friend Shira (who I met on a boat trip on the Côte d’Azur last year) for lunch, and I passed a ‘San Francisco-style’ burrito place that tugged in the pit of my slightly bulging stomach at my sense of nostalgia for the famed tummy-torpedos I remembered so well. But like the people who told me that that Mexican food and BBQ in New York aren’t going to be as good as where they originated (which I find partially true, but I’ve had great French food in New York and wonderful Italian fare in San Francisco, so perhaps I’m becoming a little too globalized for my own good) I’m going to agree that it’s pretty hard to replicate a San Francisco burrito. So in my twisted logic that says you can’t get a good San Francisco-style burrito in New York City, but good Tuscan roast pork is a possibility, porchetta it was. And boy, am I glad when my convoluted reasoning works out. Porchetta is the perfect place to eat. I always say, “The perfect restaurant makes just a few things, and does them perfectly.” Price it fairly and people will be happy. It doesn’t seem so hard, does it? I don’t need a long menu with everything—including the moon on it; I’m happy to have a place that just roast chickens on the spit or brings out generous plates of good charcuterie. And while I don’t mind a fancy meal once in a while, it’s much more fun to sit outside on a bench and catch up with a friend while fighting each other for crispy bits. I usually win, but that’s because I don’t have good table manners. But I’ve learned to be okay with that. 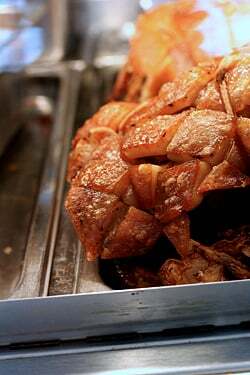 Each roasted pork has crust that’s so hard and crackly that you’ll probably think you bit into something you shouldn’t have. 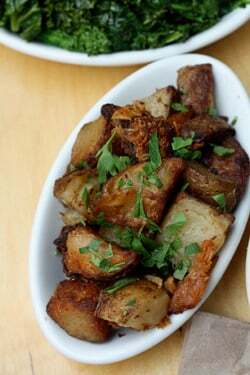 Which happened to me when I pulled out what I thought was a roast potato I’d speared on my fork, but was actually a dark, caramelized chunk of pork skin, firm on the outside and meltingly tender within that had been tossed with the potatoes. If you within a 100 mile radius of this place, speed by and order the Crispy potatoes and burnt ends ($5). Please, for the love of God, or whoever you worship, do it just for me. I am feeling a little faint just recounting that dish, so I’ll stop talking about it. But do order a neat oval dish of Cooking greens ($5), quickly sautéed in olive oil and whole cloves of garlic. As someone who constantly craves greens, eating mouthful of this hearty mix of kale and broccolini felt like a good dose of fiber to scrub away any bits and pieces of pork fat that might be lingering in my insides. If I wasn’t wearing my only pair of clean khakis, I would have been a little more aggressive with these greens and I am trying to work out my calendar so I can squeeze in another visit, and bring a rubberized apron (and a few damp towels) so I can let myself go whole hog. Although I gotta say, we didn’t do too bad without them. Where have you had good Italian food in San Francisco? I use to live there and am moving back up but had a hard time filtering through all the hodgepodge of Little Italy tourist spots. Would greatly appreciate it being half Italian myself. Also, just made your malted milk ice cream and mixed in cookie dough to make “Milk and Cookies” delicious! What I wouldn’t give for a forkful of those greens … kale and broccoli rabe have been impossible to find in Paris…It will have to wait till I get back to NY I guess. Enjoy your trip David! I must agree that this is one of NY’s best kept secrets…until now. 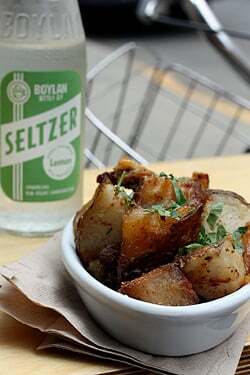 I’ll definitely take your advice to try the gloriously crisped potatoes that are visually – and likely tastfully – reminiscent of the pork itself. I can’t say it enough, I’m really looking forward to meeting you this evening! david! if you go back, please stop by abraço a few doors down–absolutely amazing hole in the wall. jamie is a wonderful barista and elizabeth is my favorite pastry chef in nyc!! everything she makes is amazing. You know, the cheap and cheerful places are the best. Everything looked so good. I’ve been thinking of a trip to New York this fall and Porchetta sounds like a perfect place to go for good eats. 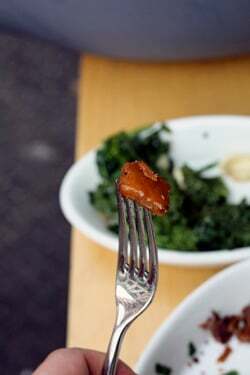 dark orange and overflavorful caramelized pork skin, this is plain heaven. I love the way it is always partly blown out with crispy bubbles. I often cook a pork rouelle (a round and 2″ thick slice of ham or pork shoulder, with the bone in the center and a side of the slice covered with pork skin still attached) in the oven for 50mn or so, just to have the pleasure of munching bits of this delicacy :D.
I love the idea of a side dish made of kale and broccolini. how clever ! how appealing ! (how cheap, how my god :D !) It’s a shame that almost no restaurant here, no matter the fanciness, has tried to offer this to French customers :( . Actually I’ve never seen kale or broccolini in any French market i’ve ever went to :[ . Do you think that those vegetable are available in France somewhere, or have you ever found those in Paris ? I’d be happy to have some tips to find those greens if you or your readers living in France have informations about this. Thanks for helping me plan where Michael, Brian and I will be eating and snacking when we arrive on Labor Day. Especially the tip about the salted caramel donuts! I will miss you at the Border’s signing today. I’m so bummed. Perhaps you did a recipe reading from your book too. I would have loved that! Hope you had a great signing in NYC! ohhh, I love to make pork shoulder, slow roasted all night (10-12 hours, depending on size). I can’t find a source locally for roasts with the skin still on, but I can find one place that leaves on a decent layer of fat, so that works fairly well. I score the fat and rub with salt & pepper, sometimes some other seasonings. 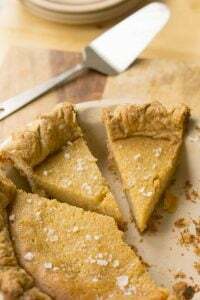 You are so right about the crispy goodness on the top (I don’t fear natural pork fat, BTW, provided it was from a humanely-raised pig that had access to its natural omnivorous diet, and not just agri-garbage (corn, soy, etc.). OK OK I’m there tomorrow………. Caught your “act” at Border’s.. What a crowd !! and what a night for the air conditioning to crap out.. It was fun seeing and hearing you “in person”… Fascinating and fun presentation.. Thanks Dave.. I am so happy to see that you are a foodie without being a food snob! My partner and I fall into the same category and are happy as can be when eating good food ranging from the simplest fare to Masa’s in SF. And thank you for your generosity in sharing recipes. My love of cooking started with baking in my teens but as the years went by, practicality demanded a greater focus on main courses. Your blog & recipes have rekindled my love of making sweets this summer, much to the delight of everyone around me. 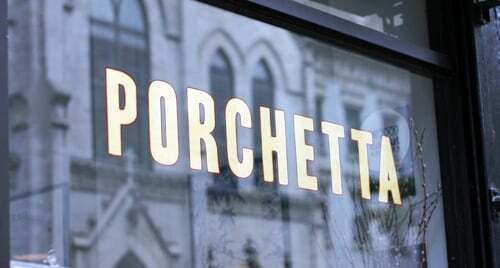 I wish I lived in NYC so that I could meet you and dine at Porchetta. The pork, the greens, the potatoes…everything is just perfect. Maybe I will get to Porchetta at some point and I hope you make it to Atlanta! 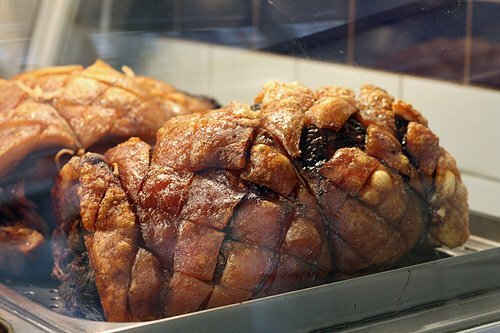 Great post, especially the pics… I love Porchetta but I can’t justify the price. For another Italian lunch experience just a 5 minute walk from Porchetta is Motorino on East 12th Street, their $12 week day lunch special is the way to go when visiting the East Village. I hope you have time to try it before you leave New York. Alright – I am really jealous, now. Very difficult to get a meal like that at a price like that here in South Australia! I have so wanted to go to this place. Great post. Loved your photos. Sounds like a great meal. By the way, 7th Street between 1st and A is in the East Village, not the Lower East Side. In fact, according to Wikipedia, “The Lower East Side (also known as LES, L.E.S. and Loisaida) is a neighborhood in the southeastern part of the New York City borough of Manhattan. It is roughly bounded by Allen Street, East Houston Street, Essex Street, Canal Street, Eldridge Street, East Broadway, and Grand Street.” Which is 7 blocks south of 7th Street. Glad you’re getting around. … and I ‘m guessing you were able to get the “burnt ends” here after “burning out” at RUB Barbecue. Asked a friend if he had been to RUB when he was living there and he said, “Several times and … they were always out of the “burnt ends”! A porchetta sandwich is one of life’s decadent treats – not for the everyday dining delight. Every Saturday at the Farmer’s Market in San Francisco, the Roli Roti truck parks and the long, long line follows for their porchetta sandwich. I do part take every few months in this true delight. 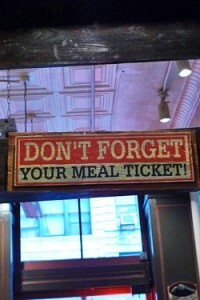 Next time I make it to NYC, I will have to check this place out. Thanks for sharing and I enjoy your blog. I’m probably an odd one in that the pork itself doesn’t thrill me, but oh golly! Those potatoes and greens! So vibrant and crunchy and surely delicious! Hi David! I loved hearing and seeing you at Borders tonight! As a musician who has to greet people all the time after concerts, I totally know what it must have been like tonight so thanks for being so nice to all of us. Are your cheek muscles spazzing out now from having to smile all night? :) And you totally didn’t need the list – you were great! I hope you like the nori/kim. It’s one of my favorites I bring back from Korea when I visit. If you like it, let me know – I’ll totally bring a box with me to Paris next month! I’m serious! I’m bringing a box to my friend in Berlin and nori is super light! 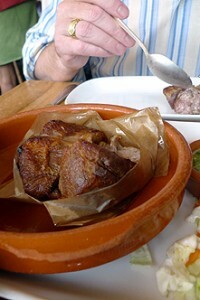 merce: That was choice #2, but the idea of this caramelized pork was too much to ignore and we ate here instead. amusette: I think it’s unfortunate that kale and broccolini are impossible to find in Paris. (And believe me, I’ve looked.) I think they just don’t eat stewed or braised greens like they do in Italy. 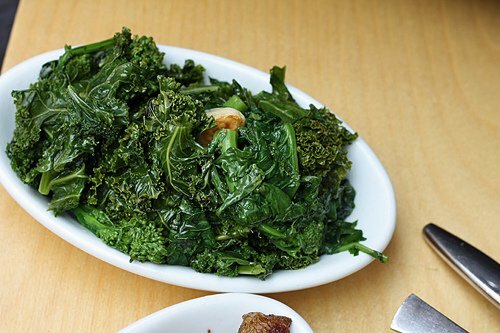 You can find certain kinds of greens (notably chard) in Paris, but I’d love to find some real kale, since I love it stewed with garlic and olive oil, like they do at Porchetta. Everything looks absolutely delicious! Oh, please tell us about the bread…. I just LOVE good bread! Thanks for taking us all to lunch. *I’m going to cook-up the greens and potatoes this weekend! GREAT signing tonite! I was so star struck that I forgot to say “thank you!” for the “great arms” comment. Enjoy the rest of your visit. Try to get to Hill Country. It is yummy and I love the name of the chicken breast–the Dolly! One more thing – Levain Bakery 167 West 74th Street has the sickest cookies– try to get there. Thanks for a wonderful reading. Unfortunately I couldn’t stay to get my book signed and to say hello (that was one very *long* line), but it was great to put a voice and body to your words. You are utterly charming, a true mensch. Enjoy the rest of your stay. Well, I do not eat pork, but the BREAD in the photo looks fantastic, I am a baker. Ah yes, porchetta…such porky goodness. 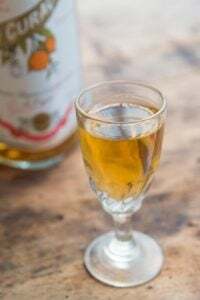 I first tasted it in Frascati, Italy. Buy the pork from a street vender, buy bread from another. 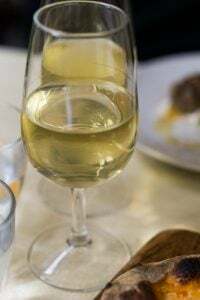 Then sit down in a dark deep storefront where they pour you carafes of Frascati wine strait from huge barrels in the back of the space and provide you with tables with paper tablecloths. I’ve tasted Porchetta when I was in Roma from the typical kiosks… and I tell you what is worth tasting. That crackling fat inside your bread makes you wanna stay there eating the whole lot. Those huge pieces of ‘Porchette’ where amazing for some photo shots. Why did you leave those potatoes? Merci for sharing your insights and experiences at the reading last evening. As you said, others have commented that your observations about living in Paris are “dead on,” I too believe it to be true. I have been to Paris and I smile (respectfully) at the gentle pokes. cecily: If there’s a ‘quirk-free’ city in the world, I don’t know what it is. Paris is indeed a special place and if you really want to hear people talk about the Parisians, just travel through the rest of France. It was cute having that Frenchwoman there who nodded in agreement. Of course, being in New York, there’s plenty of curious behavior here as well. Last night, I saw people eating on the subway (I know, how odd is that?! ), folks stood patiently in line without trying to cut in front of anyone else, and I even wore flip-flops to my booksigning—Quelle horreur! Amy: Thanks for coming..and for the recommendations. Ron: Actually since I live somewhere were AC isn’t an option, I didn’t find it too bad. But I was so thirsty afterward I needed 2 bottles of sake with dinner to quench my thirst. Lisa: I don’t know exactly what the bread was, but thing it was some kind of ciabatta, since it was puffy with lots of irregular holes, and had a great crust. But I may need to go back for confirmation. . .
On a trip through Tuscany we heard about the country road side stops where you can get Porchetta. We found one on the way back to Florence where we were staying after driving around the country. Parked the car and walked inside to smell the roasted pork and herbs! Not much conversation as you just get one thing…a sandwich. Served up on fresh baked bread and no spread of any kind. We sat leaning on the hood of our car, not speaking as we enjoyed the simple pleasure. FANTASTIC! 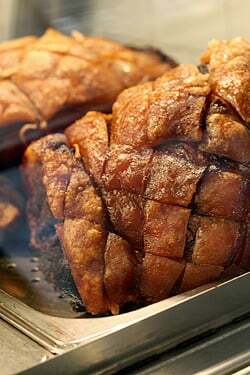 We’re living in London now and the Sunday Pub Roast is a great source for roasted pork! I fight for the crunch bits too! Love your observation that “The perfect restaurant makes just a few things, and does them perfectly.” Completely agree, and one of the (many) reasons I love Porchetta (the other reason being that I live to eat not eat to live, etc etc). The first time I ate there … twas absolute bliss. I’m pretty convinced that, these days, I actually prefer the places that are small and tucked away … but maybe that’s just the New York Kool-Aid speaking. Hope your time in the city is going splendidly. Oh, for the fan of Korean and spicy (redundant, my white boyfriend who hails from Minnesota would say) food, may I recommend David Chang’s spicy pork sausage and rice cakes dish at Momofuku Ssam? (Corner of 12th and 2nd). p.s. Their seasonal dishes are always fun to check out, too. Very playful, crazy weird flavors that all come together just right in your mouth. And I’m just going to assume you’ve already been told to try their steamed pork buns. Re: the greens in Paris issue, I’ve had some luck finding non-chard-or-spinach greens in the Chinese grocers in Belleville. They have something called “feuilles de brocolis” which looks kind of like broccoli rabe but isn’t as bitter. Sometimes you can also find mustard greens, which make me very happy. What a fun event last night! Charming as you were at W.H.Smith, I think your sensibility plays even better to New Yorkers. Loved that you brought a serpilliere for show-and-tell — I am so bringing one back next time, perfect to wrap around that jar of crunchy Speculoos spread (Casino!) that didn’t fit in the suitcase last month. If you don’t make it up to Harlem, Blue Smoke and Hill Country aren’t bad. I’m with Lisa on the occasional few months at the Roli-Roti truck at the Ferry Building. It is available at not just the Saturday market, but also their Thursday market at the Ferry Building. The lines are long and totally worth it. Here’s why: the best ingredients. Fresh Acme bread which they use to mop up the porchetta juices that end up on the cutting board. 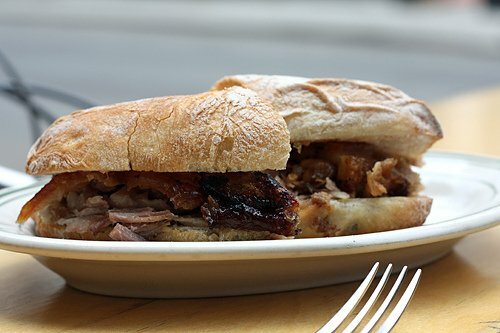 On the bread, the meaty Porchetta with the layer of crunchiness. Then, they add about a 1/4 cup of this carmelized onion jam and then sprinkle Fleur de Sel de Guérande and then a whole bunch of fresh crisp rugula which adds a nice contrast. Oh, and of course the potatoes cook under the rotating porchettas and chickens. Mouth-watering! I guess one more have-to-go restaurant in New York. So, where am I? In PARIS! For 6 months! And where are you? NEW YORK! What’s wrong with this picture??? I have been here since the first of June and I am DYING for those greens! Yeah. The pork looks fabulous and so do the potatoes. But I am awash here in pork! You can hardly NOT get pork here. But GREENs…they just don’t serve them. All their main dishes are brown on white plates. I am starving for GREEN, fresh, al dente, perky green…… And I need a little attention, David. I need to know where the hell does one go for a decent middle class meal? I’ve been to Joel Robuchon’s Atellier. I LOVE it! But I can’t do that every night. And BTW there aren’t many of him around here either. I was disappointed in Pierre Gagniere’s Gaya. Nothing imaginative there and uptight waiters. 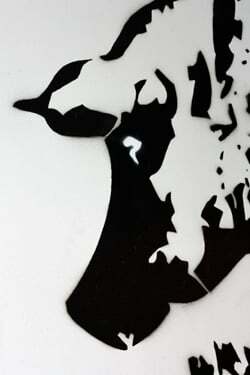 And the pricetag makes you think about life. 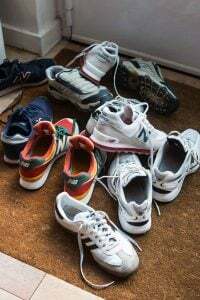 But, when I leave my apt. 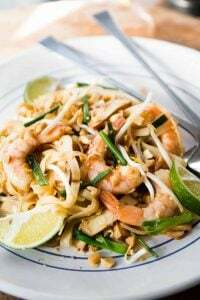 of an evening with no big deal at hand,I just want to eat a decent dinner in a nice, small place, there is no place to go to get eatable fare. Its either high or junk? I am in the east end of the first and I can walk for blocks and see nothing that serves anything even slightly above bad. This can’t be right. HELP! I know you French, and by now you are French, get 5 weeks off, but what’s a girl to do in this town while you are parading around N.Y.? I’ve been told by a couple of green grocers that they don’t carry these types of greens because they are “amer” (bitter) and the french palate doesn’t care for the taste. I guess that’s why you can find spinach, chard and so many varieties of lettuce. One of my favorite organic suppliers assures me that in season (winter) he carrries both escarole, and a variety of ‘chou’ which is similar to kale…. 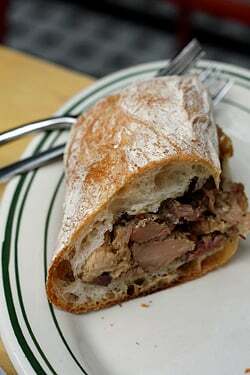 Next time you’re in NorCal check out the porchetta at Fatted Calf, it is beyond incredible. I’ve certainly seen kale in Paris, but unlike in the US it wasn’t sold as a few leaves bundled together, but as either a whole or half chou frisé. Granted, I’ve left France more than 6 years ago, so maybe there has been a dearth of chou frisé since then. 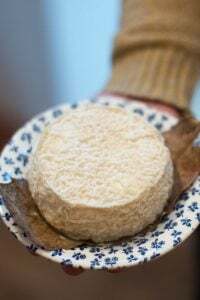 If you don’t see them at the marché, try a maraîcher in winter. Broccolini I’ve never seen. Even broccoli is a relatively recent thing, I don’t think I had seen one before the mid to late 1980s, and they were exotic then where I lived, in Normandy. Thanks, David – like I said, you’re a real mensch! Yeah, I’m a bit hesitant to even think about cutting a line here as New Yorkers take lines very (very) seriously. my Nana’s green always used broc rabe..wonderful…bitter rabe…love it! Suzi: It looked like broccolini to me, but I didn’t ask. amusette: Thanks-I even asked some Portuguese folks where to get kale in Paris and they didn’t know. I like that little shop, so I’ll give them a try next winter. micki: I’ve not had the porchetta in San Francisco, but have had it in Italy and I’d say this was just as good, if not better. On the same block is Lukes, a fantastic place for a lobster roll. I love to do a grazing lunch on that block — Porchetta, Lukes, and maybe a walk up to one of the Momofukos. amusette> thanks for the name of the shop and the address ! 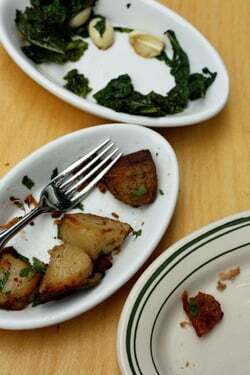 next time I’m in paris, I’ll be glad to ask them if they have some, maybe I’ll be lucky :D.
David: According to the on-line order menu at Porchetta the greens are a combination of Swiss chard, kale and BROCCOLI RABE (my favorite!!! I just can’t get enough of anything bitter). You must go to the Roli Roti truck at the Saturday farmer’s market at the Ferry Bldg. in SF the next time you are here. The cress on the sandwich makes it. My arteries are clogging just thinking about it. Leaving for London / Paris in 3 weeks so am re-reading Sweet Life in Paris for refresher course in all thing Parisian. I’ve been looking forward to lovely crispy duck confit, but after seeing that divine porchetta I may have to stop in NYC on the way back. I love reading you and the fact that you’re such a fantastic photographer of all things food-related is just icing on the cake. Are you still here in NY? You must, must go to Dos Toros. 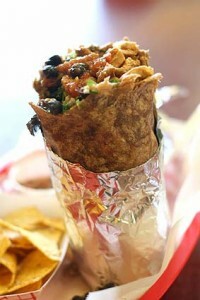 Coming from San Francisco myself, I can say with some authority that these are the best burritos in NY. The two guys who started it are from Oakland, so you know it’s for real! On the strength of this post a friend from Boston and I made our way to Porchetta for lunch the day after the USA:Brazil friendly at the New Meadowlands this past week. WOW! Every bit as marvelous as described. 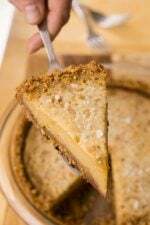 Oh my – that crust! I would gladly get into an arm-wrestle with anyone trying to snag the last crispy pieces out from under my nose. Very entertaining post! Good info, you can now actually get the product from Costco.com. they even have the whole pig! I’m so happy that you enjoyed Porchetta as it is one of my favorite places as well! Next time you visit, you should definitely check out Porsena. It’s Sara’s new venture (down the block from Porchetta) and she serves excellent cozy pastas and entrees. I hope you will enjoy it as much as Porchetta!